ZN9…the ultimate audio interconnect! ZeroNoise 9 series interconnects feature the highest quality materials, the best noise rejection capabilities and the cleanest signal transfer of any interconnect StreetWires has ever released. These interconnects ensure the best clarity, dynamics, harmonic structure and tonality while maximizing sound stage, depth and imaging. Quad conductor, Phase Perfect Teflon® dielectric, dual split pin rhodium plated banana, and optimized HyperTwist™ Technology are just some of the reasons ZN9 interconnects are the industry's best interconnects. Only StreetWires ZN9 Interconnects feature our Super Quad construction with twice as many conductors for unsurpassed sound quality. 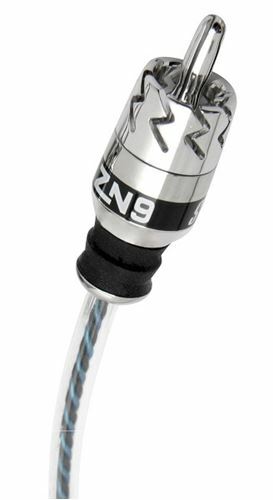 And, ZN9 has HyperTwist™ Technology that takes twisted pair to a new level—Channels are individually twisted and then intertwines for maximum noise cancellation. Why buy a low noise cable when you could have ZeroNoise? Installation has never been cleaner or easier with the installer friendly design of ZeroNoise Interconnects. With 2- or 4-channels in one cable, you'll run fewer cables through the vehicle. The Ultra Grip body is small enough for the tightest spaces and the CrystalFlex® jacket bends and slips through the vehicle with ease. ZeroNoise Interconnects are the noise free link between your source unit and your amps or other components that use RCA type (low-level) connections.